The blue oval revealed details of its latest autonomous vehicle project at this week’s Mobile World Congress in Barcelona, showcasing a Fusion (Mondeo) Hybrid fitted with 3D scanners that can read the road ahead and announcing three new research projects with leading universities to further develop the technologies. The vehicle uses four infrared light sensors – mounted on the roof and looking like moose antlers – that scan the environment to a full 360 degrees around the vehicle to map the road as well as detect objects such as other vehicles, pedestrians, cyclists and animals. Ford says the LiDAR (Light Detection and Ranging) system can generate a real-time 3D map by bouncing infrared light off everything within a roughly 70-metre range surrounding the car, and calculates the distance between vehicles and objects at a rate of 2.5 million measurements per second. “The Ford automated research car represents a vital step toward our vision for the future of mobility,” Ford’s executive vice president for Europe, Middle East and Africa, Stephen Odell, said. 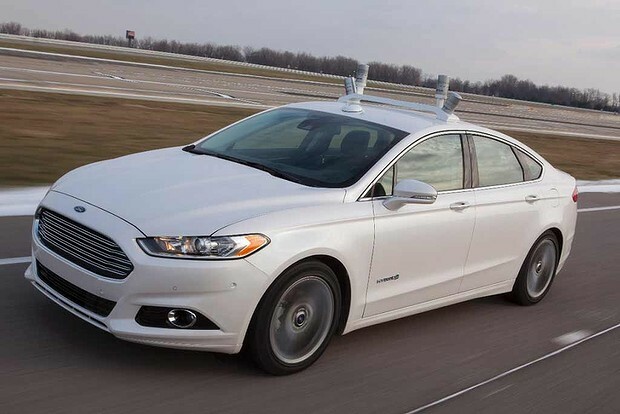 The vehicle has been developed in collaboration with the University of Michigan, which will continue to work on improving the scanners and the computing processing speed “to help the vehicle understand its physical surroundings and make routing decisions.” Ford has also included insurance company, State Farm, in the project to leverage its expertise in evaluating the risks and benefits that may arise from autonomous driving. Further to that, it has also implemented another research project with the highly commended Massachusetts Institute of Technology (MIT) to improve the algorithms needed to allow the car to predict movements of vehicles and pedestrians, while researchers at Stanford University in California are studying how the vehicle could automatically manoeuvre so the sensors can see around obstacles. Over in Europe, it has hooked-up with RWTH Aachen University to further develop the interface between the car and its occupants, studying how seamless the driver can retake control and override automated functions at any time. It will do this through the construction of a high-tech driving simulator. Makes me a little sad to think my son won't be modding cars in 20-30 years time like I am today..